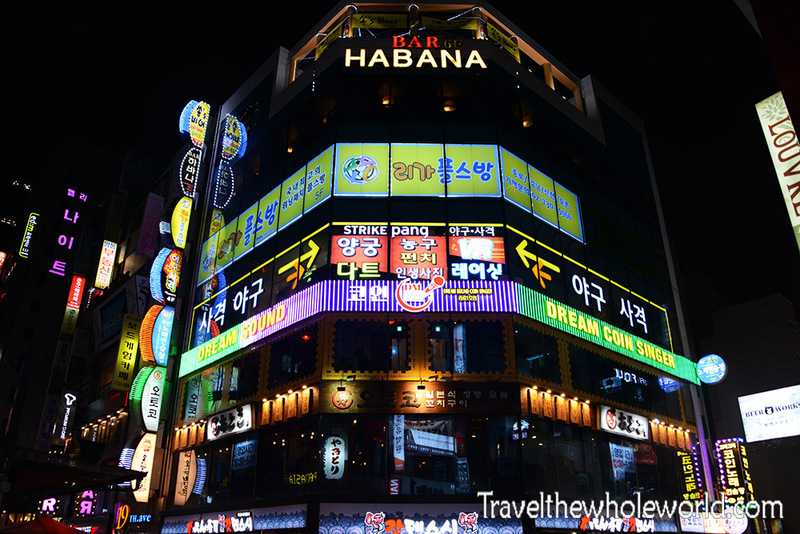 I feel like there is so much to do and see in Seoul that I wasn’t sure where to start! This is a city I’ve been to multiple times, with my second and third visit being almost 15 years apart. Each time I discovered new parts of the city and feel like there is so much more to see. 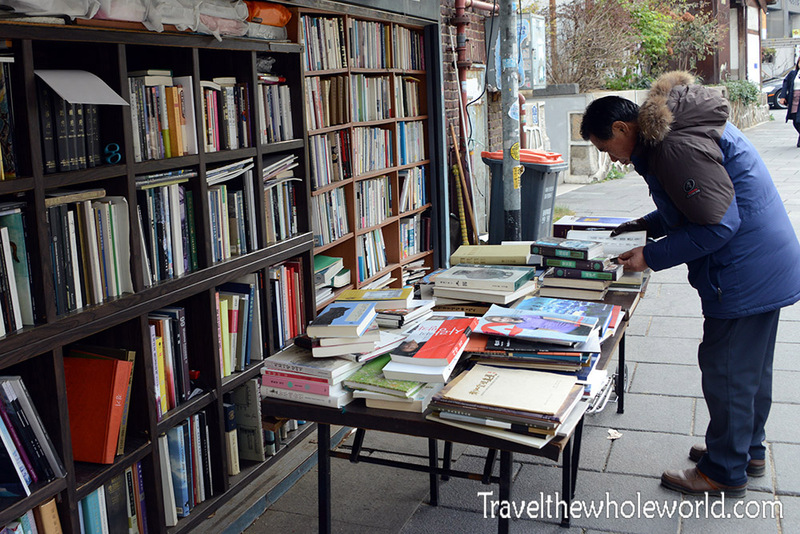 On my most recent trip, my favorite experiences of Seoul were those neighborhoods that I just stumbled upon. A great example is in this photo above, a large LED rose garden in the heart of the city. I didn’t even know this place existed until I accidentally discovered it on a walk one night! It was actually this incredible building that got my attention and later led me to the rose garden. 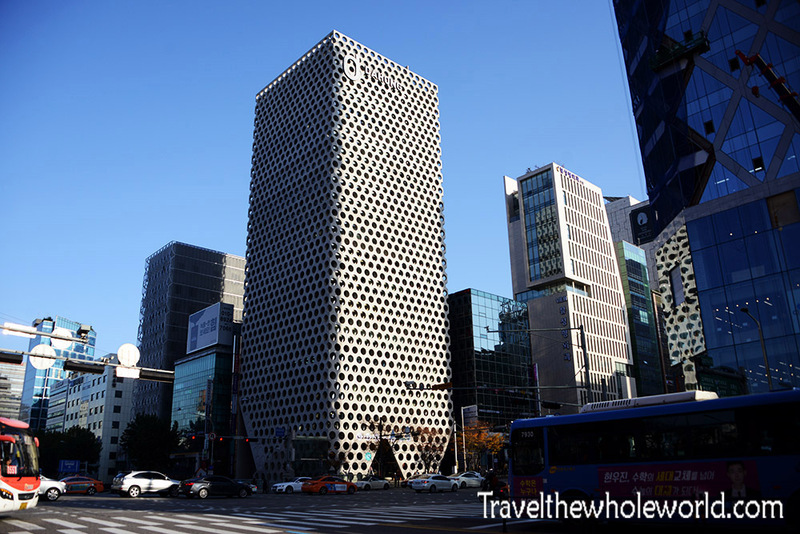 This is the Dongdaemun Design plaza. I hadn’t seen it on my previous trips to Seoul because it didn’t exist yet. It opened in 2014 and hosts exhibitions, fashion shows, and even has several retail stores. 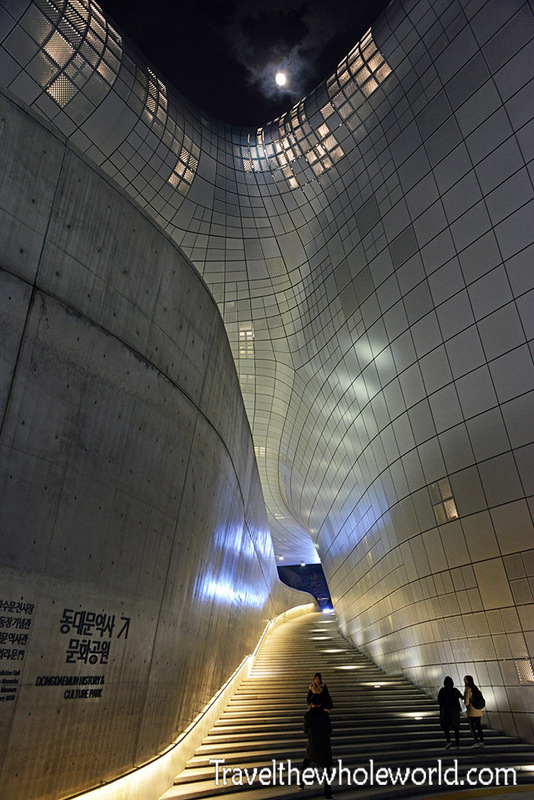 The futuristic design was created by Iraqi Zaha Hadid, and earned Seoul’s pick as the World Design Capital in 2010 while the building was still being constructed. 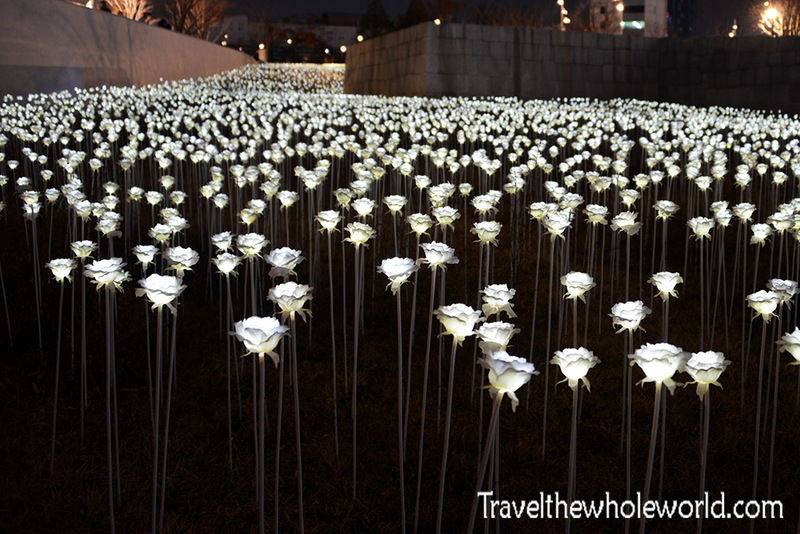 In the photo below you can see a detailed show of some of the DDP’s LED roses. 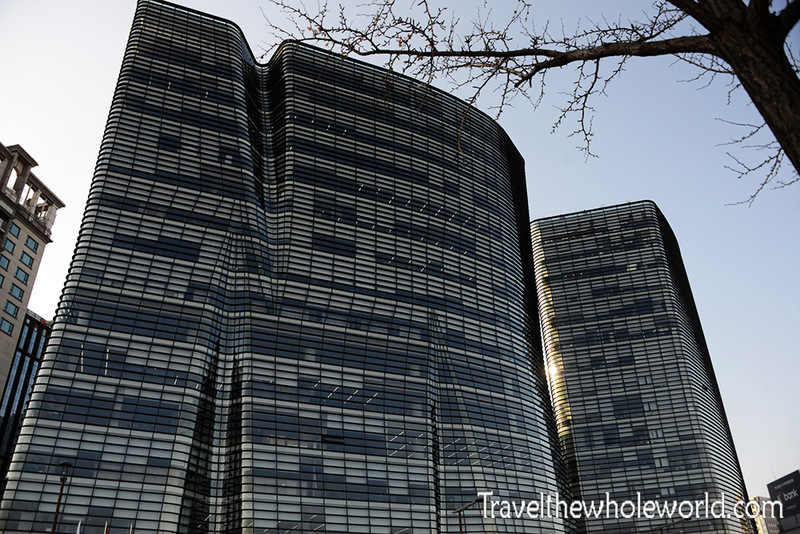 While the Dongdaemun is an impressive building, it has a very important job in addition to hosting events and exhibitions. The building actually protrudes over these ancient ruins that were built at the end of the 14th century. Because they are so old they aren’t known exactly what they were for, but are largely believed to be military ruins belonging to the Josen dynasty. They have a bit of a sad story, as they were completely destroyed during a Japanese invasion. The Japanese took things a step further and reduced the ruins and attempted to build newer structures over them. They had a goal to no longer teach Korean history or language and attempted to fully integrate Koreans into the Japanese empire. 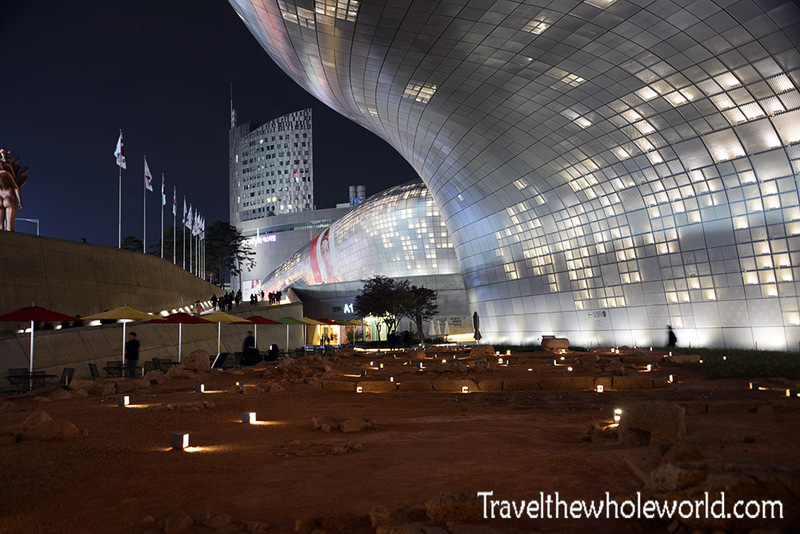 Once Korea regained its sovereignty, they removed the Japanese built structures and created the Dongdaemun Design Plaza overseeing what little remnants of the ruins exist. The main part of the ruins are what you see in this photo above, but below you can see an ancient tunnel that was reconstructed. It’s a bit of a contrast to the high tech building that is directly over it. Like the ruins under Dongdaemun, nearly all ancient sites in Korea were destroyed by Japan at multiple points in history. 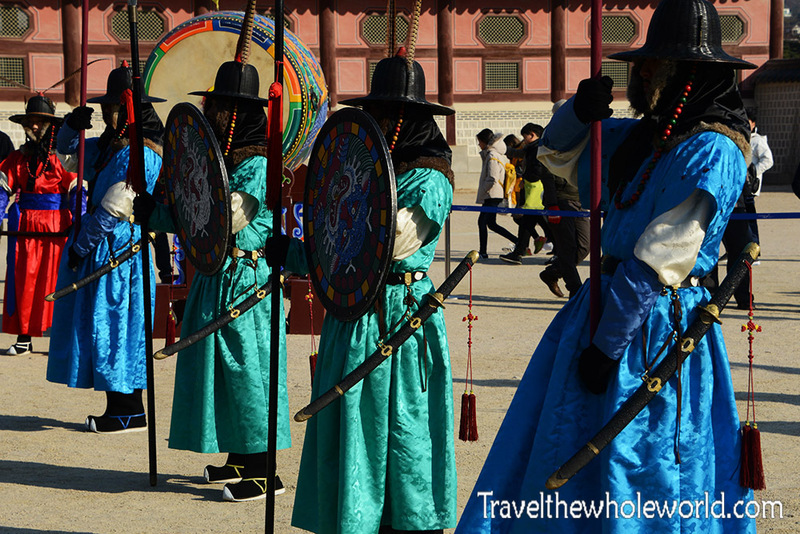 A place I visited twice in Korea was the Gyeongbokgung Palace. This was the largest and main palace of the Josen dyansty, and was original built in 1395 CE. 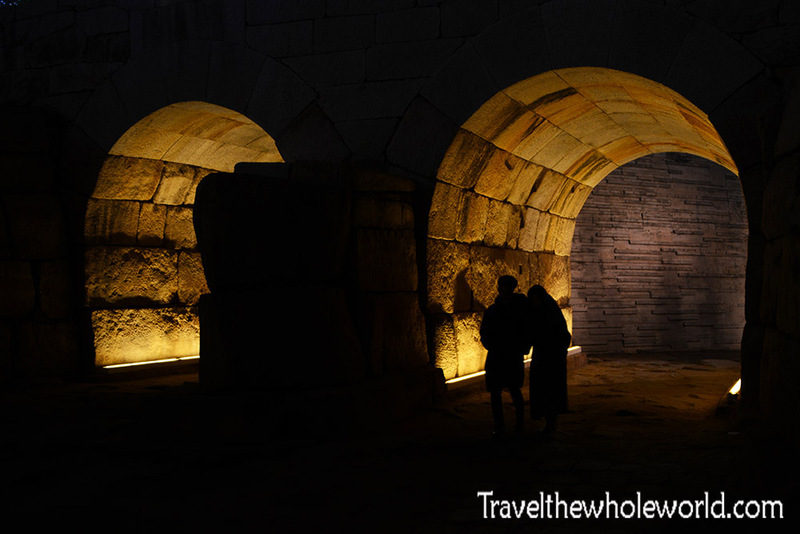 Photographed above is the massive Gwanghwamun Gate. 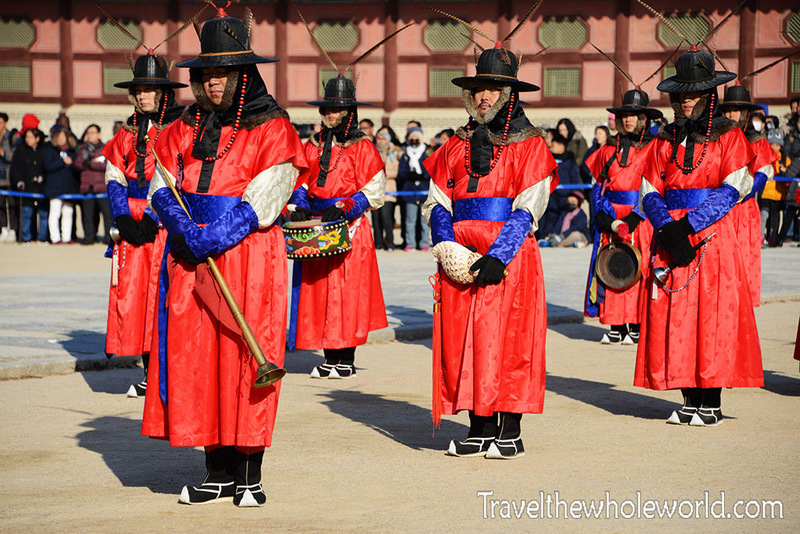 What I like most about visiting Gyeongbokgung Palace is that there are guards present that still wear traditional clothing. Similar to British guards at Buckingham Palace, these guys stand like statues while people pose next to them or take their photos. I spent five years in the Marines, and it was always emphasized that when standing guard we looked straight ahead. I noticed that these guards eye’s were darting around in random directions. For us that would have definitely been a lack of discipline, but I think in their case it was the opposite and showed they were being observant and alert. I later read that the changing of the guards is the third favorite activity for visitors in Seoul. The great thing about this ceremony is that it takes place twice a day throughout the year, so it’s hard to miss it. The changing of the guard ceremony only lasts about 15 or 20 minutes. 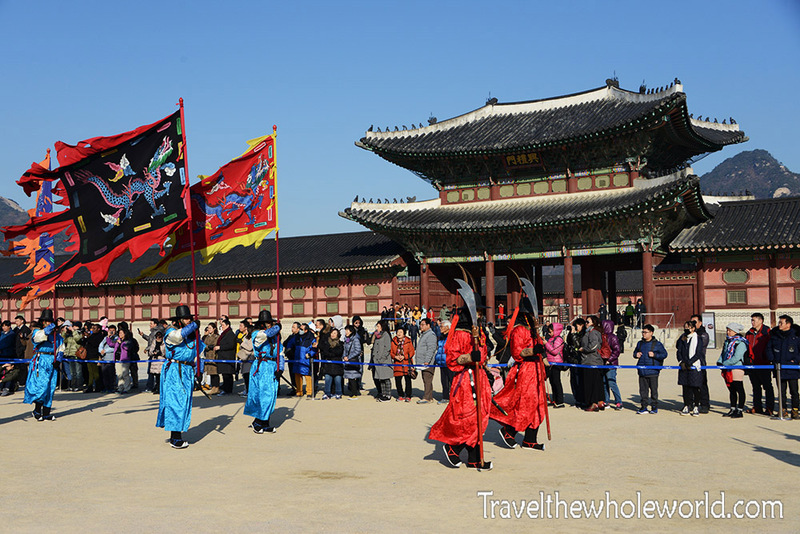 After that the guards marched back out of the palace and I was free to explore the rest of Gyeongbokgung. 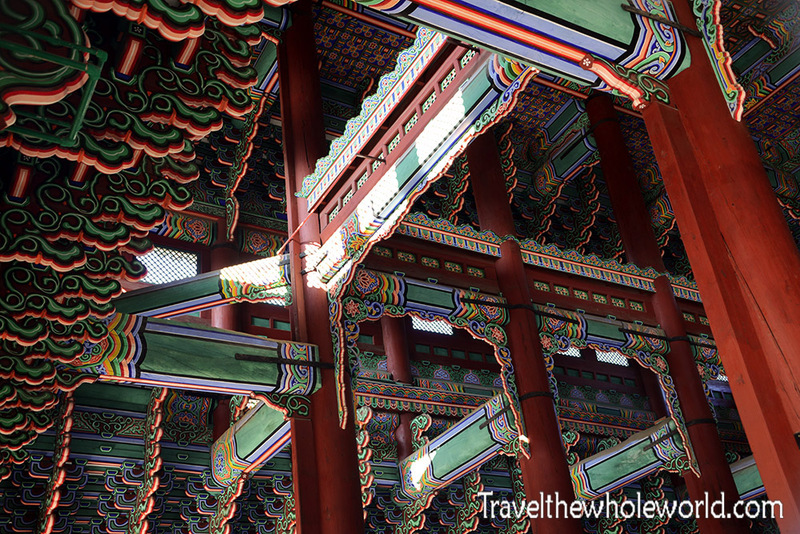 This photo below shows the beautiful interior of the main palace of Gyeongbokgung. 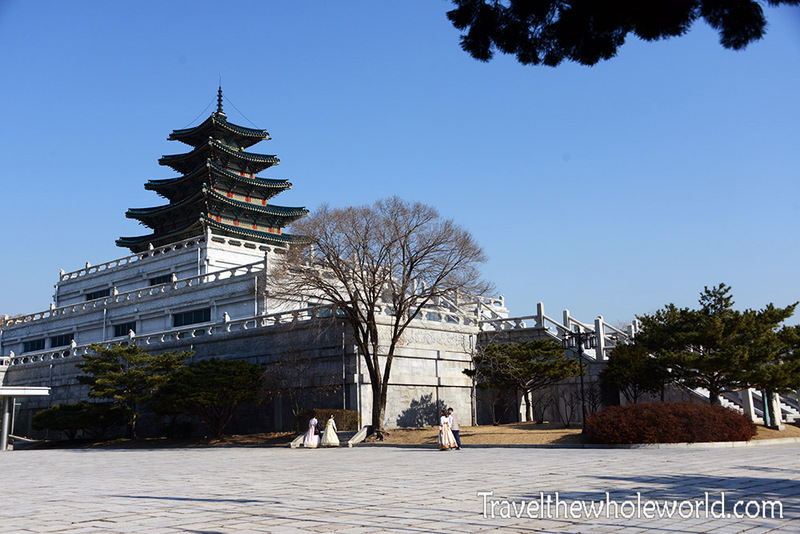 The building below is the Geunjeongjeon, or Throne Hall. I made a mistake of not coming here at night when the palace is lit up. It wasn’t until my second visit to Seoul that I realized what this place was. I had always assumed it was an ancient palace that was part of Gyeongbokgung. 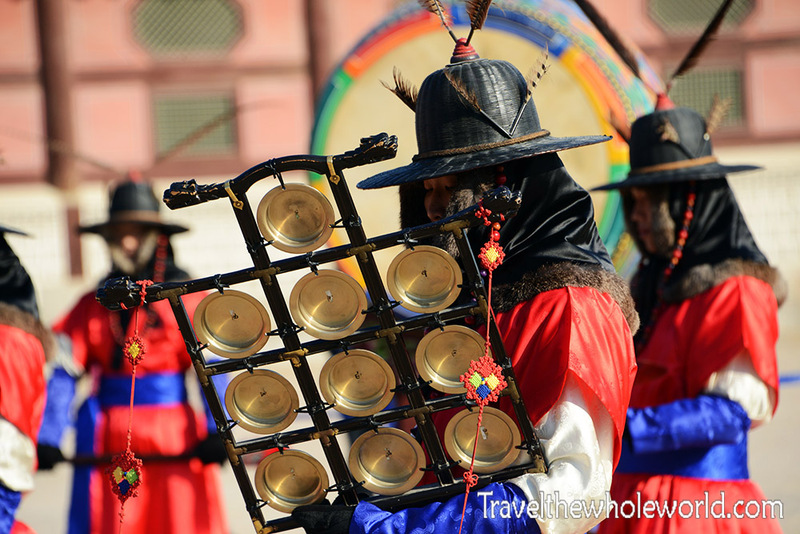 Not only is it not ancient or part of Gyeongbokgung Palace, it was actually created by the US government! Only months after World War II ended, the United States created the National Folk Museum of Korea in order to preserve their culture. 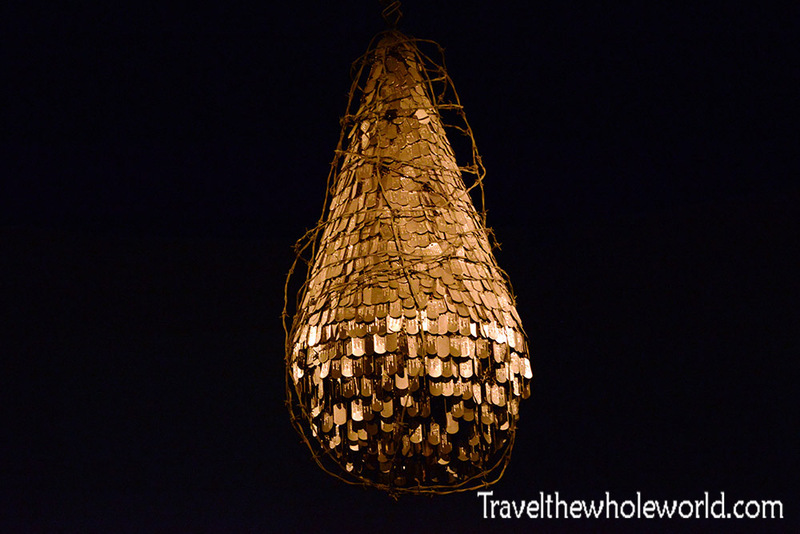 This is an enormous museum, and includes several floors inside as well as a folk village outside. 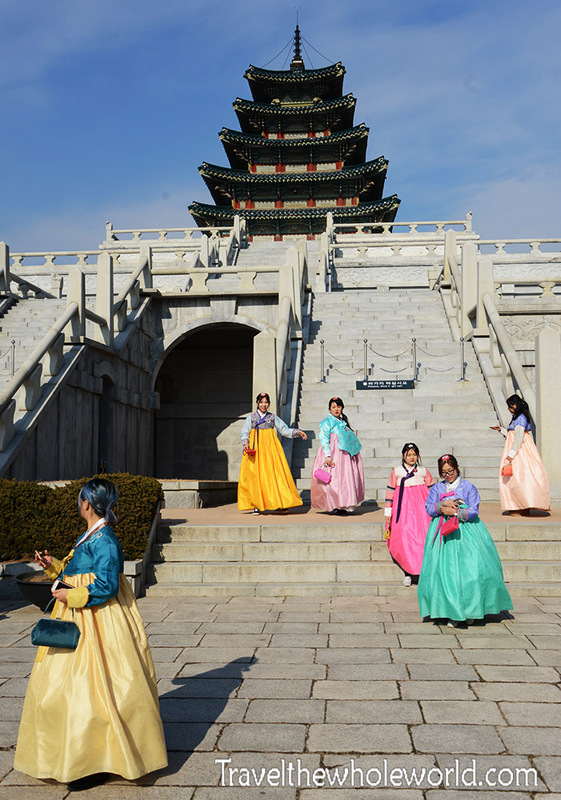 The photo below shows some young Korean women who were visiting in traditional dresses. Part of the outdoor section had these animal statues which I had first visited in 2004. When I returned 15 years later they were exactly where I remembered them! 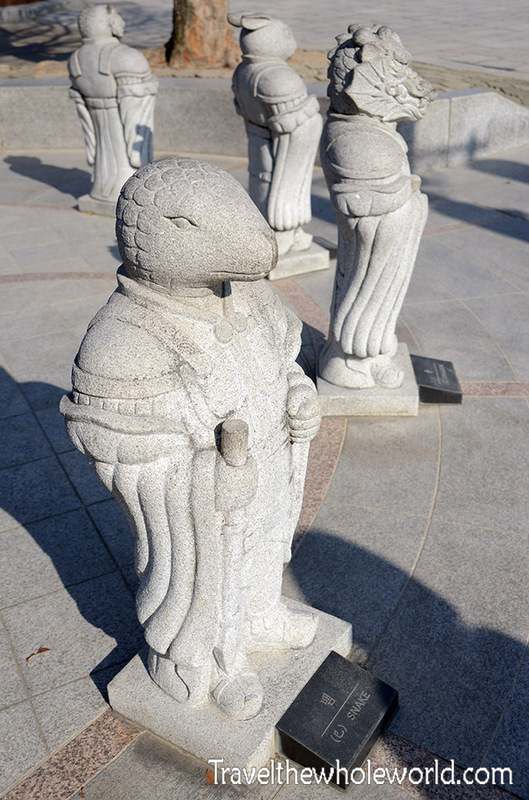 In Gyeongju, Korea I had seen a garden with statues nearly triple the size of these guys, so for that reason these seemed much smaller when I revisited. 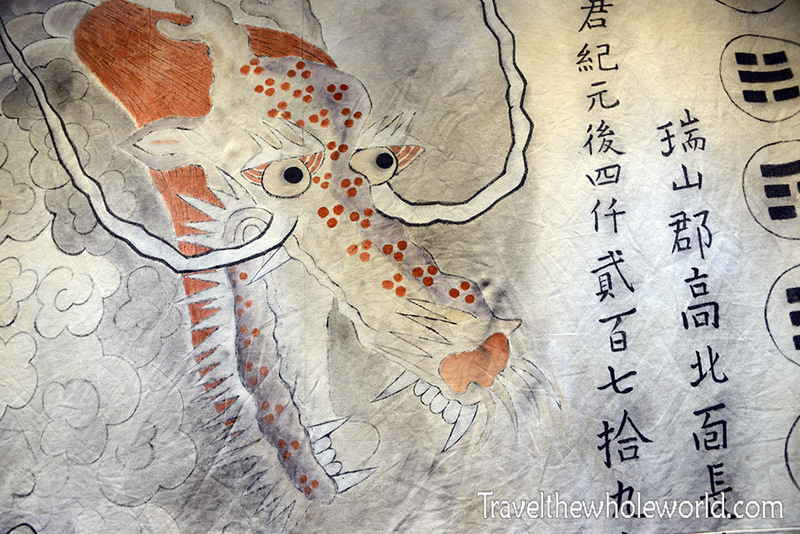 The different animals represent all the different animals of the Chinese calendar system. I didn’t do a great job taking any decent photographs of the folk village. There are several reconstructed buildings, and most of them you’re free to enter. The buildings ranged from medieval ones like this above to some more primitive structures made out of wood and straw. 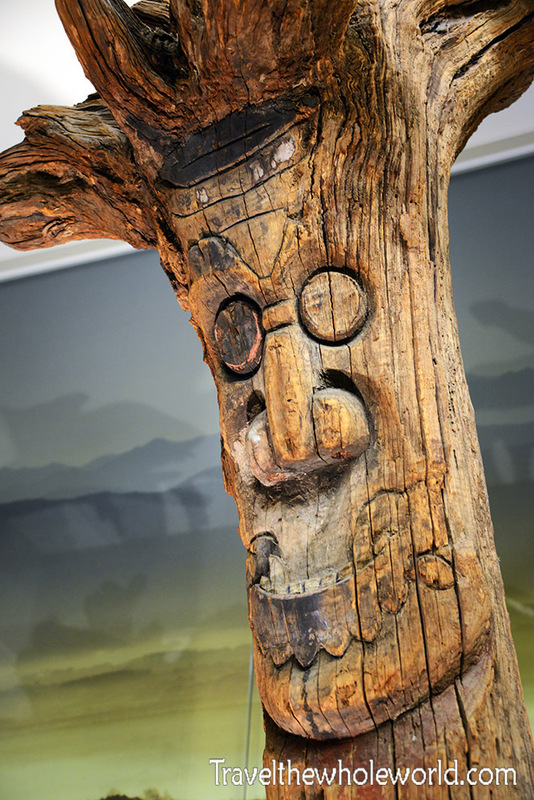 One thing I missed out on in Korea was visiting one of their regions famous for its tree carvings. The town was a bit out of the way, so difficult to reach. Even though I wish I could have visited it, the museum made up for a bit of this by having one of the trees on display. I could only image dozens of these trees all close together. I don’t have enough room to post all of the photos from the Folk Museum, but I decided to share these two shots I took. 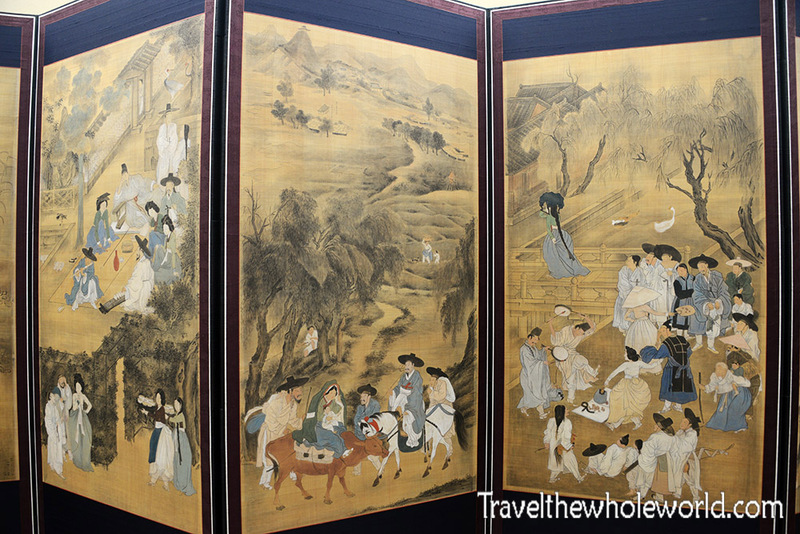 The photograph above shows some ancient artwork which depicts traditional Korean life. Below is another shot ancient Korean artwork. If you notice this art was created using Chinese characters, which used to be the standard writing system in Korea. Over 500 years ago, one of Korea’s kings decided to create their own writing system to increase literacy and efficiency. Korea remained a quiet country to the outside world for most of its history, but after World War II it developed rapidly. Their first radio tower is photographed above. 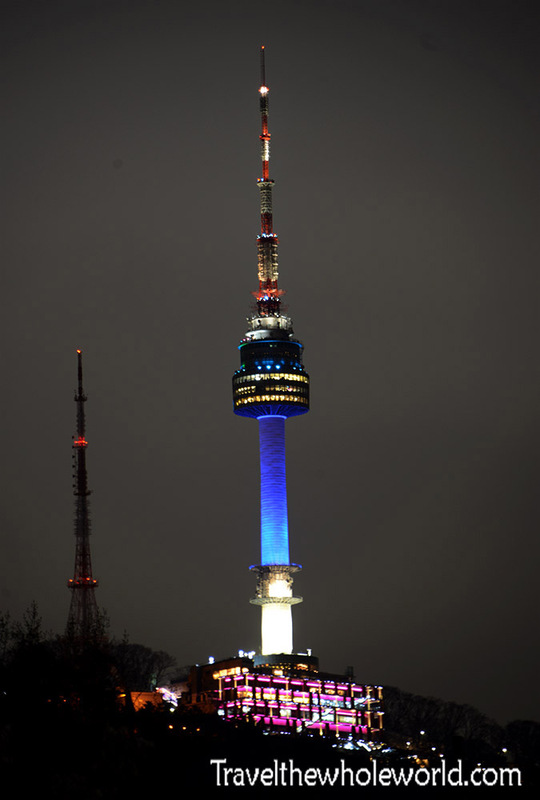 Built in the 1970’s Seoul Tower is a icon of the city and is built on Namsan mountain. Probably the biggest mistake I made on this trip was not visiting the tower itself. I had full intentions to, but got caught up in other things to do in the city. There’s a lot to do inside the tower itself, and I’ve also seen some incredible views posted online. On my fourth trip to Seoul I’ll fix this! Seoul has gone from off the map to a world class city in just 50 years. I feel like despite Seoul’s massive size and all the things it has to offer, it still isn’t fully recognized outside the country. These buildings above were called “The Trees” and were designed to resemble tree stumps. The photo below I saw while trekking by the US Embassy. Someone later told me that they thought it resembled a Sand Crawler from Star Wars. One famous neighborhood that I didn’t feel I too connected with is Gangnam. Gangnam is famous for having some of the most wealthiest residents in the country. The upscale neighborhood has the highest percentage of acceptance rates into Korea’s most demanding universities. As a traveler, aside from the night life and nice restaurants I didn’t feel there was anything special to do. I’m sure living here is a completely different experience, but for me personally the most exciting thing here was some of the unique architecture. 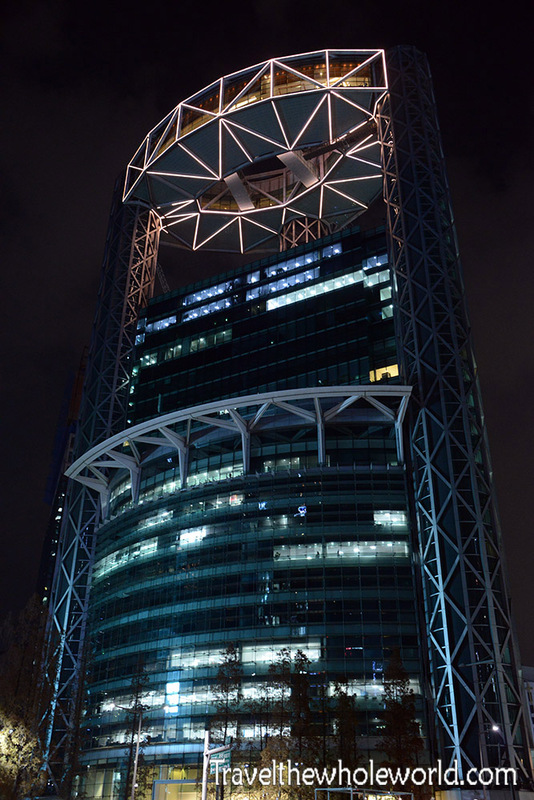 The building above is a photograph I took while in Gangnam. Even though there were probably more unique buildings here than other parts of the city, I still found skyscrapers all over the city. 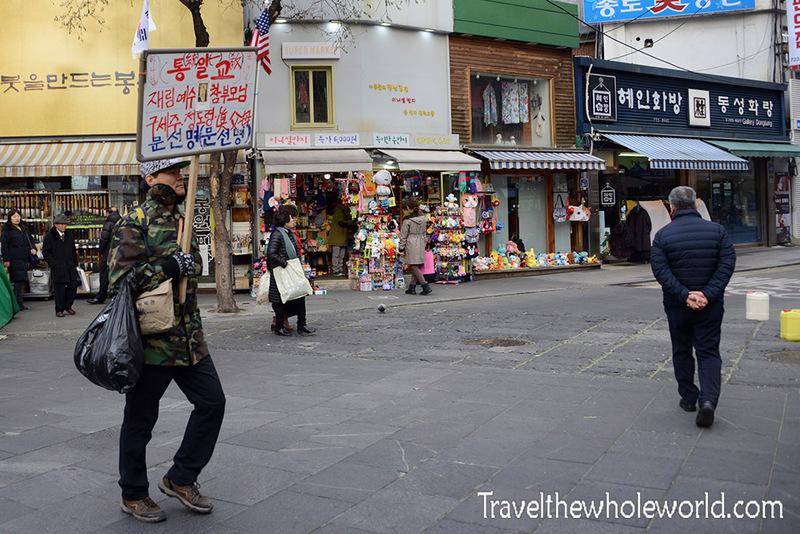 This photo below was from another part of Seoul, so maybe other neighborhoods are catching up to Gangnam. 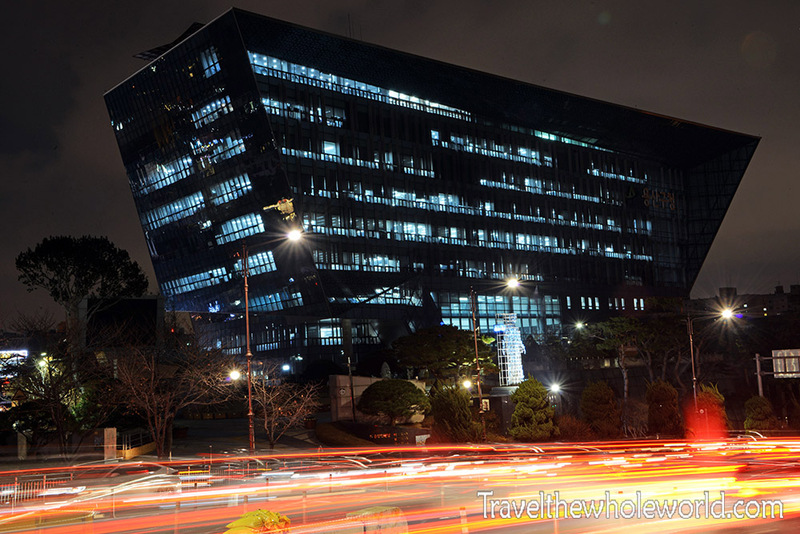 Something Seoul is famous for is its high quality and reasonably priced medical care. 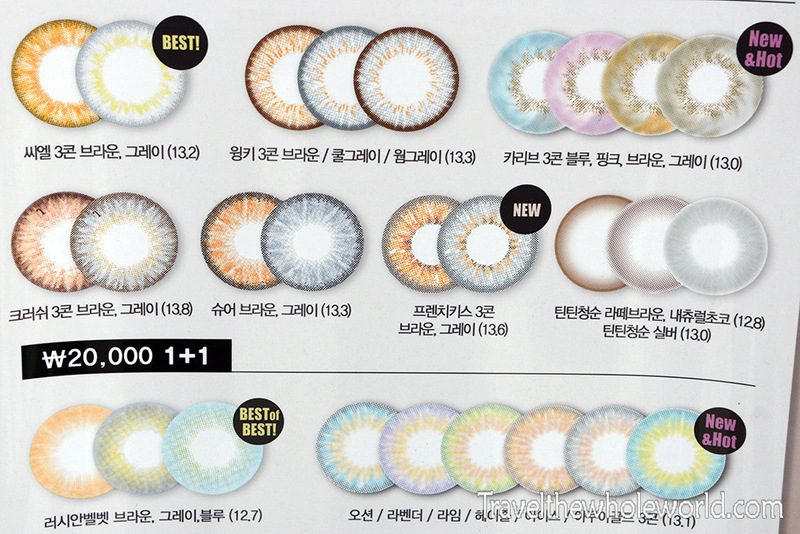 This ranges from serious surgery to simpler things such as these colorful contacts. 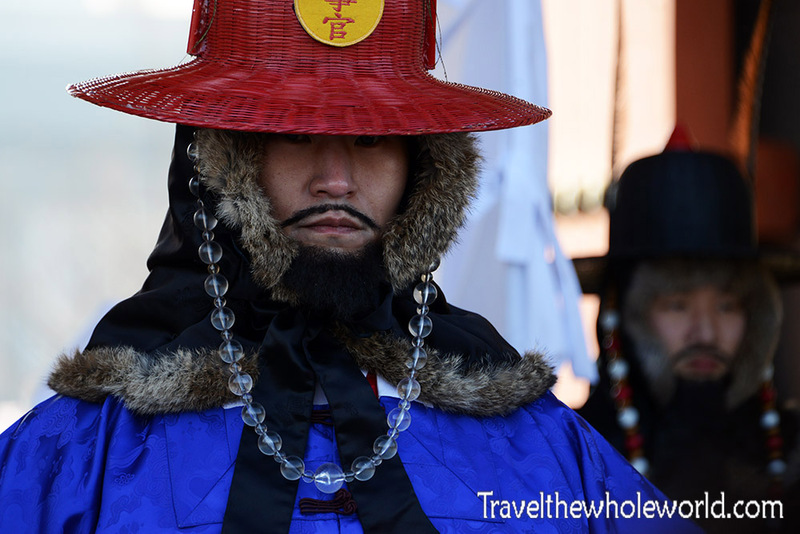 Beauty is very important in South Korea, and many go to great lengths to maintain their appearance. Gangnam is one of the most popular districts for plastic surgery and other cosmetic procedures. As such a huge and densely populated city, you can imagine that real estate is scarce and expensive. I stayed in a hotel most times I was in the city, but my last days I tried an Airbnb. It put me in a neighborhood I might not have otherwise visited, and showed me a glimpse of what a Korean apartment was like. I’ve no idea what it cost to actually buy or rent one of these, but I can say the place was small and cozy. I took the photo with my back to the window, and the only thing you’re missing is the bathroom by the entrance. 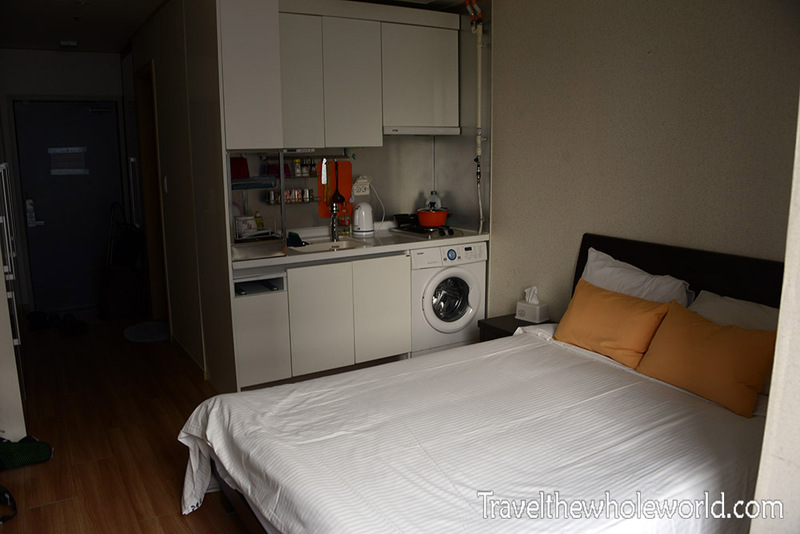 The wash machine, kitchen, and dining room table, and bed are all in the same room! I never caught the name of it, but I ended up wandering into a random neighborhood that I liked much better than Gangnam. This place felt more authentic. It lacked chain stores and had lots of outdoor vendors, some mom and pop owned stores, and of course lots of street food. I ended up trying some Korean BBQ from a street vendor, and it was easily one of my favorite things to eat here. 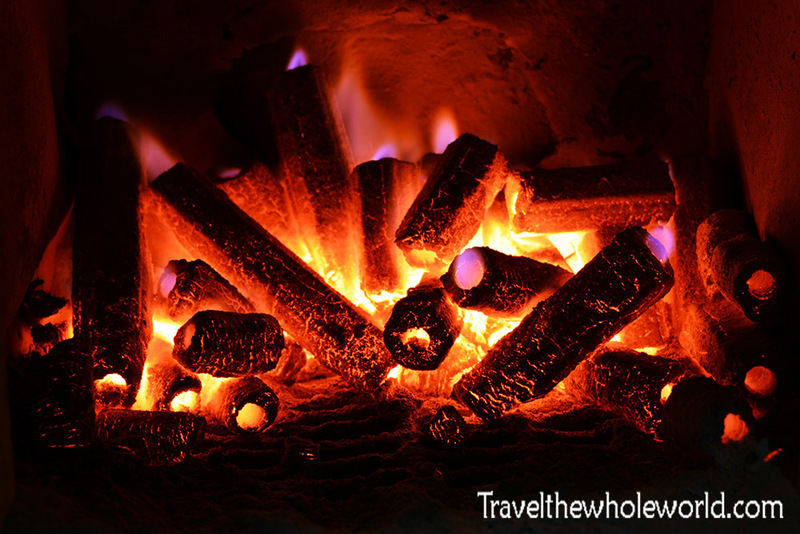 I also took advantage of some of the coal fires to get warm, since it was one of those freezing December days. Another way to take a break from the cold was to visit one of their tea shops. One thing I didn’t try was what I call the “Most Expensive Tea in the World”. I’m sure other places could compete, but they seriously had tea here that cost nearly $1,000! The neighborhood still of course had a few coffee shops. That seems mandatory to have a coffee shop every block in Korea. This backery was photographed else where, but it’s something else popular in the country. Even where I live in Virginia, there are half a dozen Korean bakeries around. I don’t see how these places stay in business with so much competition. 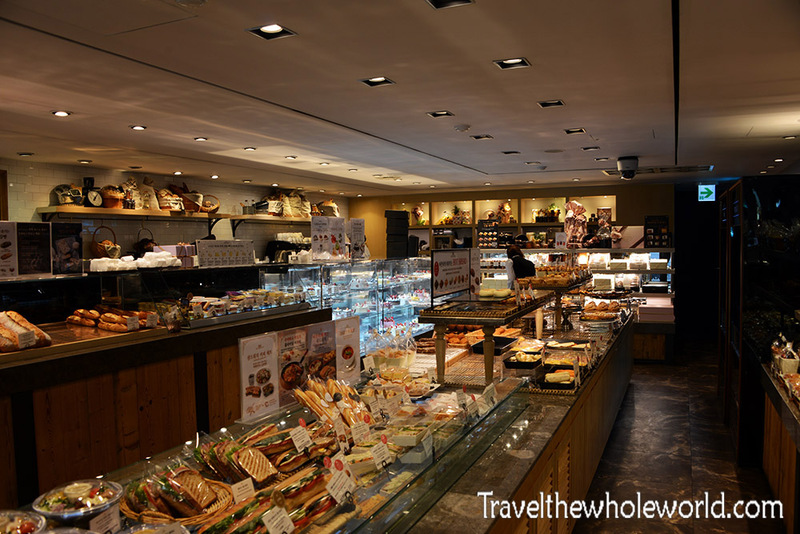 The bakeries are usually French or western style, with sometimes one or two Korean dishes. Here’s yet another district that I wandered into. This was one of the most lively night districts I went to. The fact that I kept coming across so many neighborhoods just shows how enormous and diverse Seoul really is. The most I did here was stop for a drink and continue on, but it looked like this was the place for night life! Other places I came across I was able to find out what they were. Well somewhat at least. This place was closed when I visited, but it looked like a former church that was turned into an art gallery. 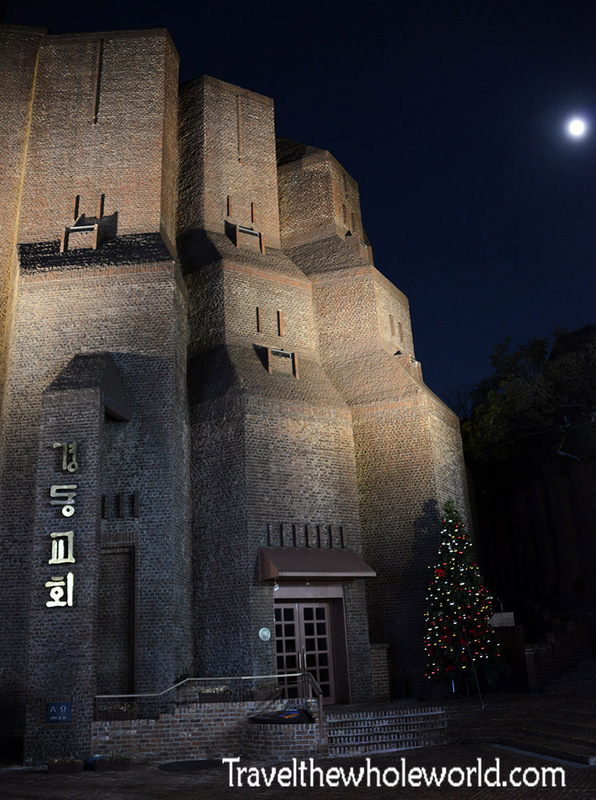 Because there’s so many churches and art galleries in Seoul, I found it nearly impossible to find out the name later. I would have loved to gone inside, but this is yet another place I’ll have to save for my return. When it comes to dinner, I feel like Korean food has some of the most unique distinct cuisines. 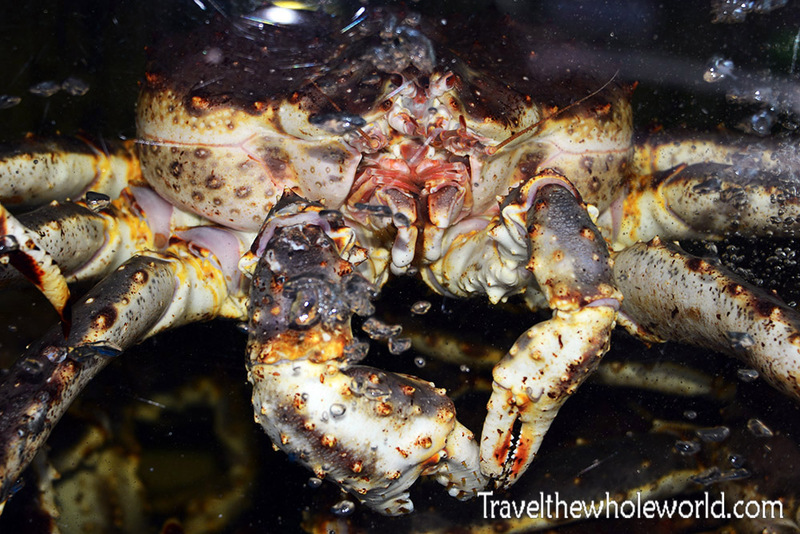 In all cities that I visited in Korea, there were always restaurants that had outdoor aquariums filled with crabs, eels, squid, and fish. I’m not too into seafood, so I can’t claim to have been salivating when seeing things like this giant crab. 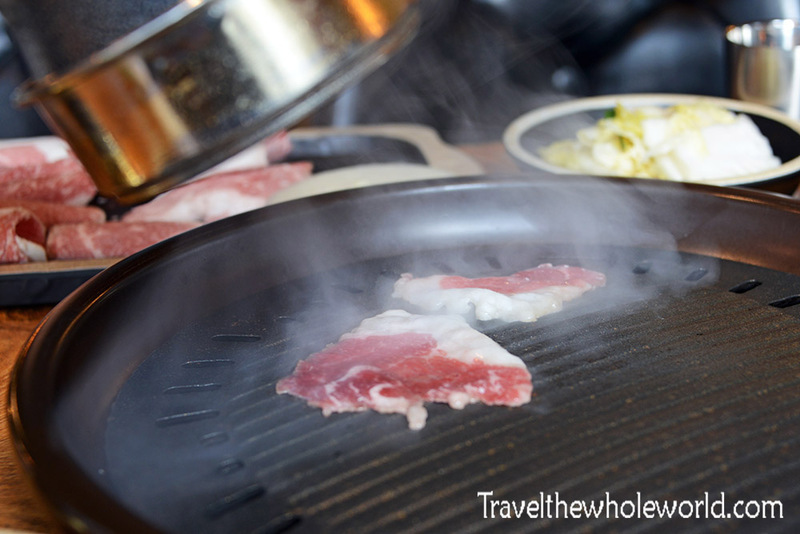 Something that’s much better in my opinion are Korean barbecues and grills. These are equally as popular as seafood places in Korea. You’ll sit down at a nice restaurant and have someone come by and personally cook meats and vegetables at your table. Nearly all these restaurants use an exhaust system that hangs down from the ceiling, and some restaurants even put your coat into a plastic bag or container so you don’t smell like dinner! 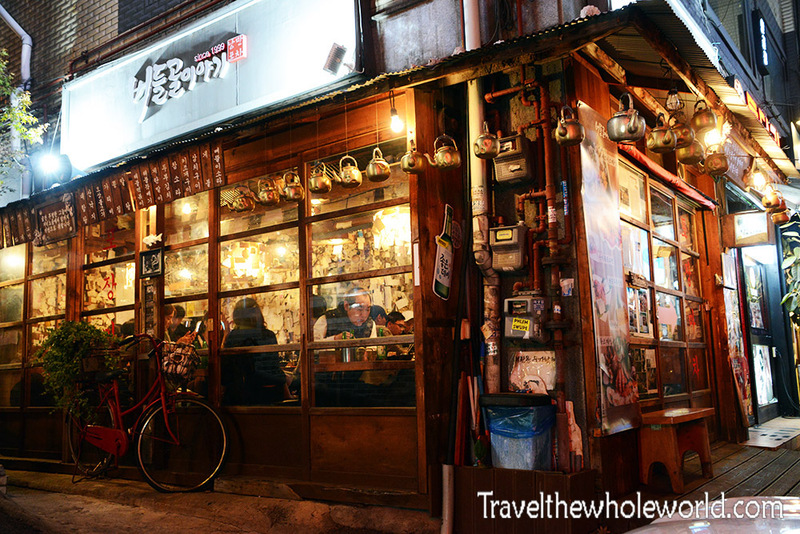 One of Seoul’s most famous districts is Itaewon. 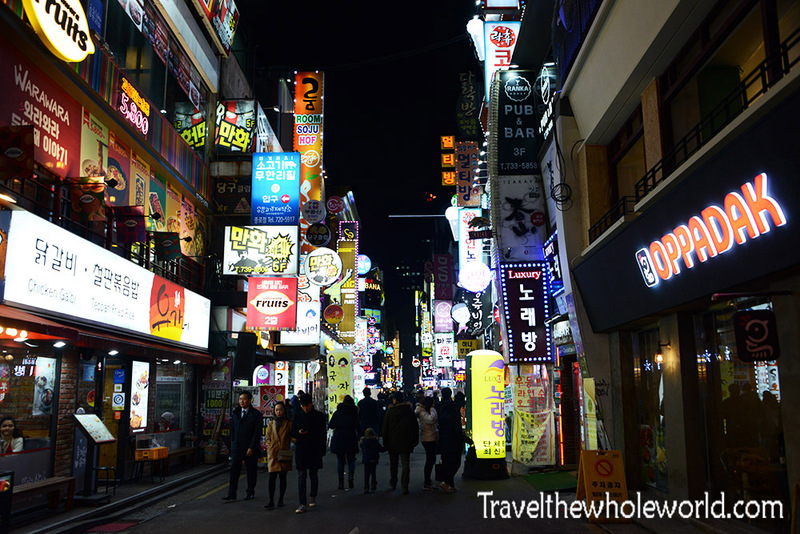 Itaewon is known as an international district. You’ll find everything here from authentic Italian and Mexican restaurants, to Indian and Chinese. 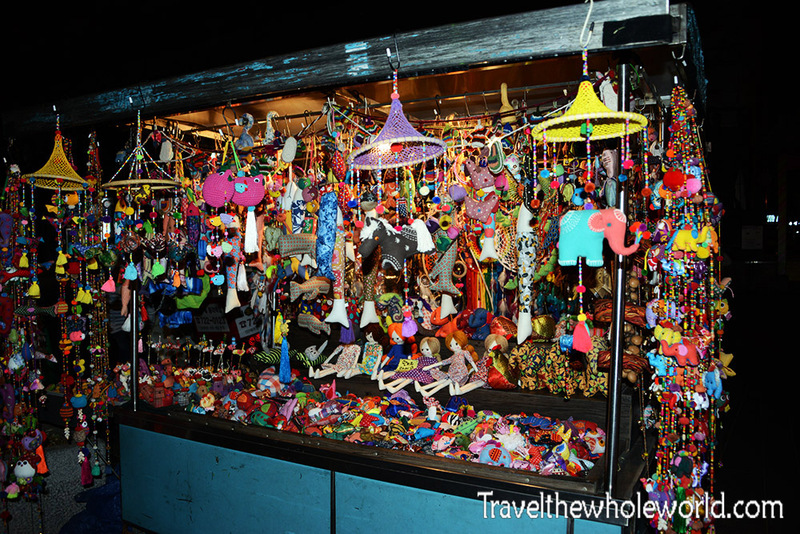 In addition to the restaurants, there’s plenty of bars, night life and great deals on shopping and souvenirs. Needless to say, this place is packed with foreigners! 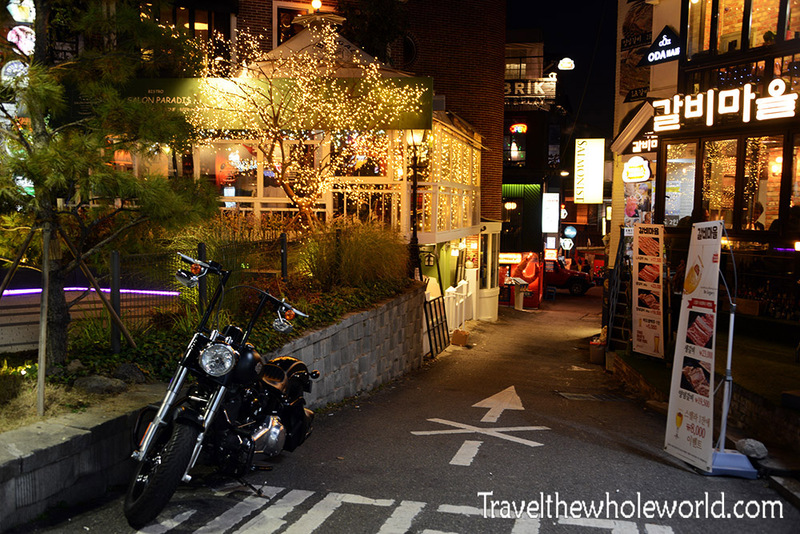 The photo above is one of the side streets entering Itaewon, with a popular restaurant photographed below. I had no choice but to eat out at a Mexican restaurant followed by some ice cream. My most recent trip to South Korea was when times were especially tense with the North. Sure, there’s always been animosity between the two countries, including the trips I went to over ten years prior. It was while I was on this trip that North Korea had launched their first true ICBM which convinced some that they could launch a nuclear strike anywhere in the world. Most South Koreans that I spoke to weren’t worried about the north. They labeled them as nothing but talkers who had no real power except to threaten Seoul. 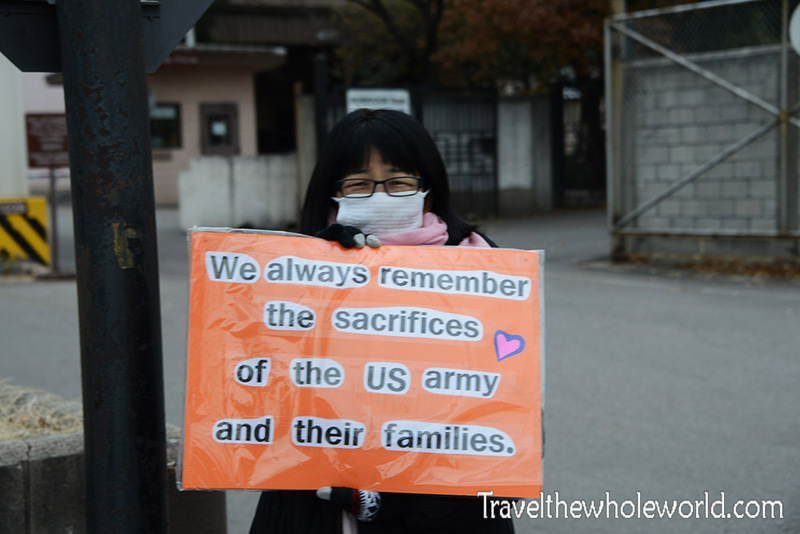 Some others in Seoul showed their American support against the north throughout the city. 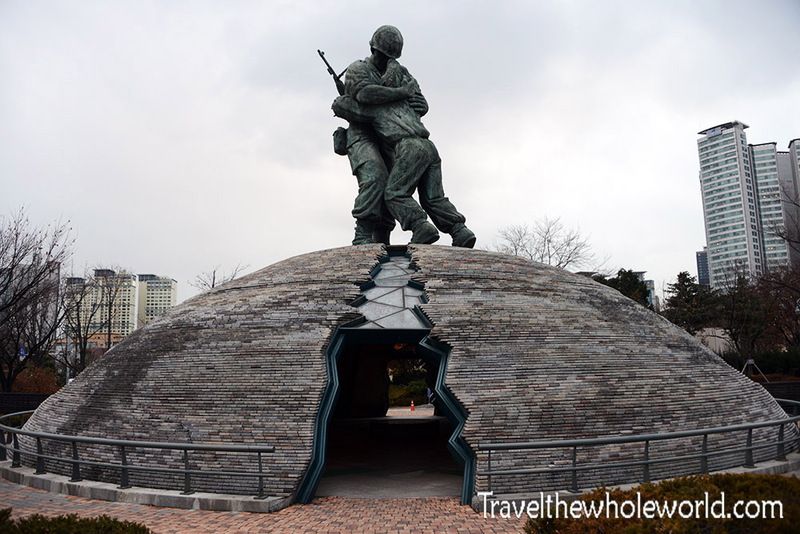 I’ll finish my Seoul page with a place I had to revisit; the Korean War Memorial and Museum. I think this should be a mandatory visit for any travelers in Seoul. 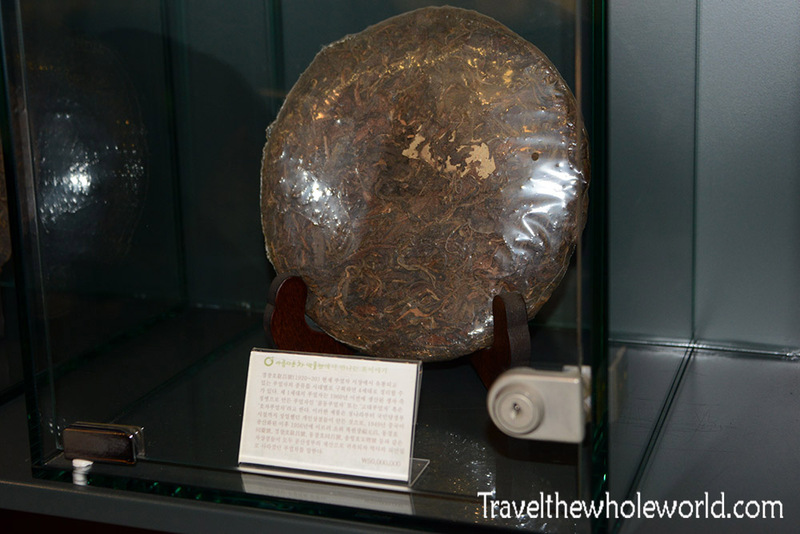 Both the memorial and museum are free for all, and cover some important parts of Korea’s history. 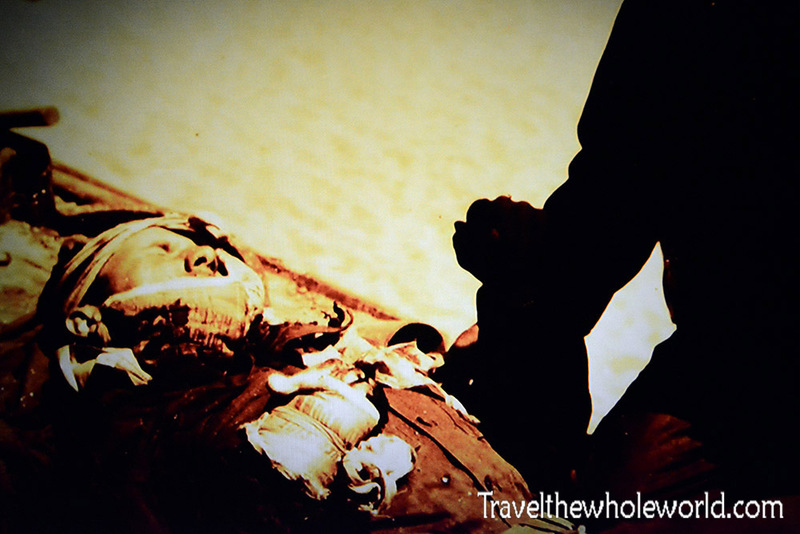 The sudden split of North and South Korea during the Korean War in the 1950’s often tore families apart. Some people even found themselves enlisted in the military and fighting people who were formerly friends or even family. This memorial symbolizes two soldiers who were fighting each other and realized that they were brothers on the battlefield. This is another war monument on site at the memorial and museum. I was trying to take a HDR photo and got a bit lazy, instead of using my tripod I used some stairs so my angle was a bit off. 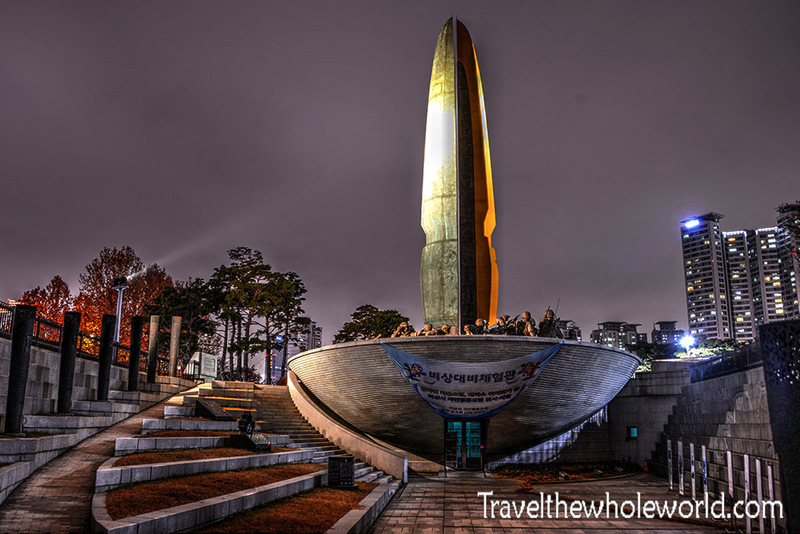 The column part of the monument you see here is also split in two halves and is surrounded by North and South Korean soldiers. While the museum is always free, if for some reason you come during off hours you can always explore the outside. There are several military weapons and vehicles on display here. I took a similar photo of this missile above nearly 15 years before. 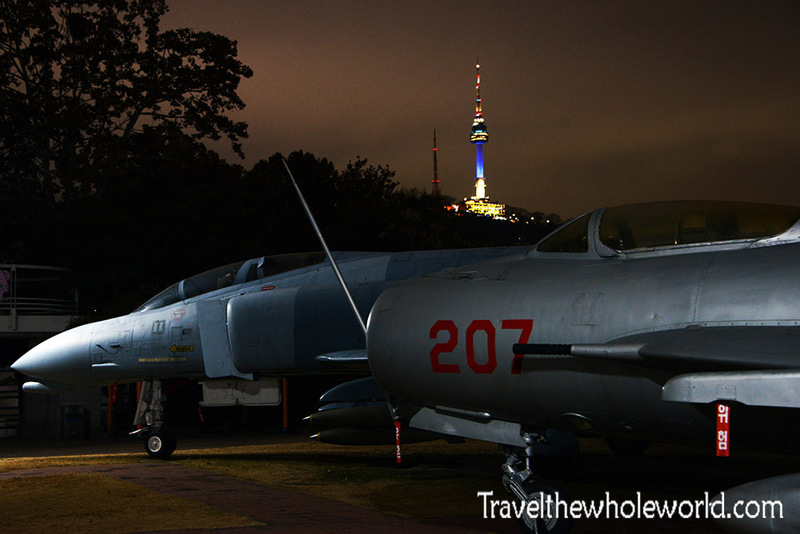 Below you can see some aircraft used during the Korean war, with the Seoul Tower in the background. My focus on the museum was the Korean War, but the museum actually covers everything from modern skirmishes to battles that took place over a thousand years ago. One of the most unique ships ever created was this Korean ‘Turtle’. 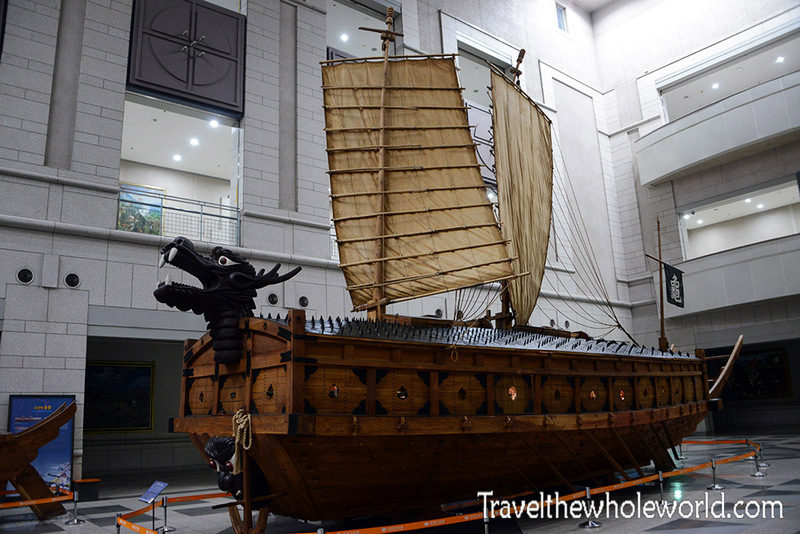 This ship was invented in the early 1400’s, and served the Korean military for 500 years. Despite how large this ship is, it’s only a replica and the real versions were roughly three times larger. The ship gets its name from the armored ceiling, which make it nearly impervious to arrows and fire. It is largely considered to be the world’s first armored ship, and gave the Koreans an enormous advantage during naval warfare. This museum is huge, so there’s no way for me to fairly represent it on my site. 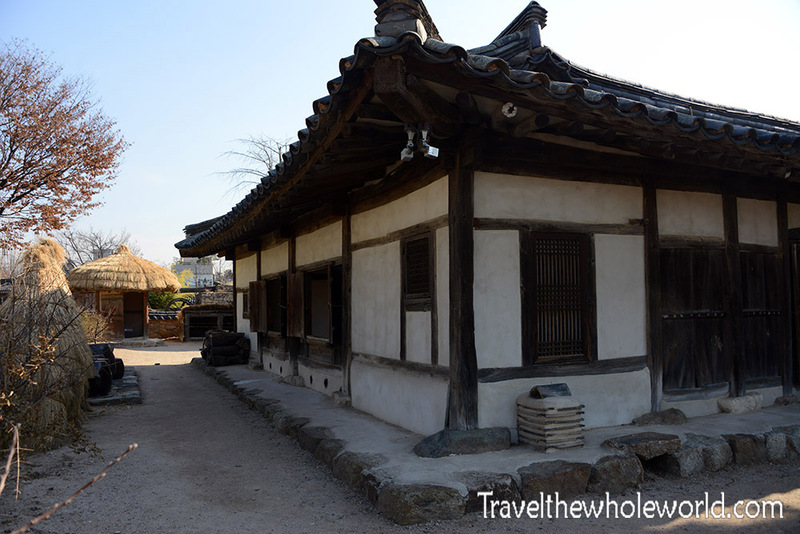 There are entire floors dedicated to medieval periods and famous battles in Korea. 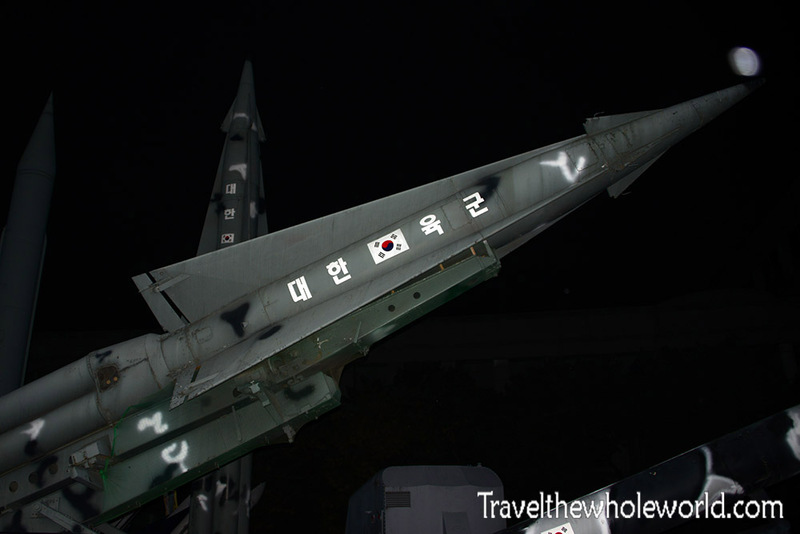 Since the Korean War has the possibility to flare up at any time, I was most fascinated by exhibits covering it. When I went to North Korea, the Korean War and World War II were everything to them. In the United States, the war is often even called the ‘Forgotten War’, since Vietnam, Iraq, and World War II get so much more attention. 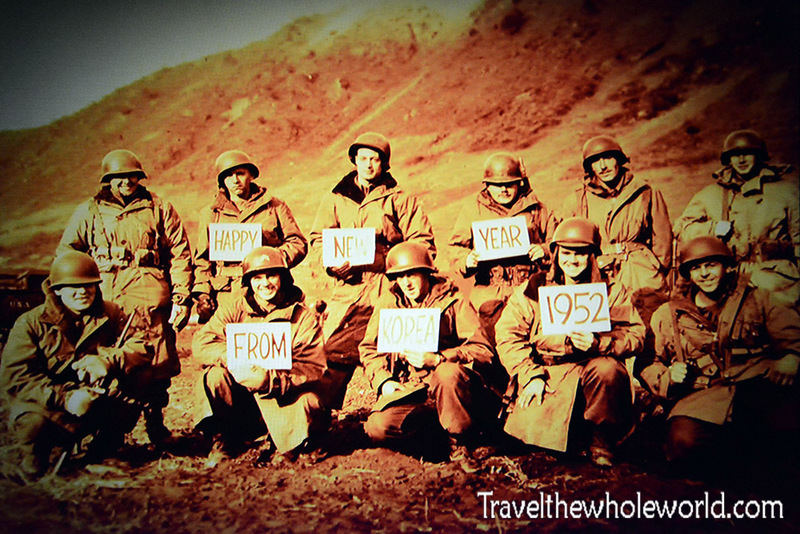 These vintage photos shows American troops on New Years in 1952, and an injured soldier below. The Korean War began on June 25th 1950, when the North tried to take advantage of an American withdrawal and suddenly invaded the South. By the time American troops were back in Korea, their forces along with the South Korean’s were pushed all the way to the very southern tip of the peninsula. Amphibious landings in the North successfully cut North Korean supply lines and the front lines were pushed all the way to the northern regions of North Korea. China got involved and the front lines moved north and south many times. Control of Seoul even changed four times between the two countries, until the DMZ was finally established at the 38th parallel. After three years of fighting, the war left up to one million people dead, and the stalemate remains today. The photo above shows one of my favorite memorials in the museum. 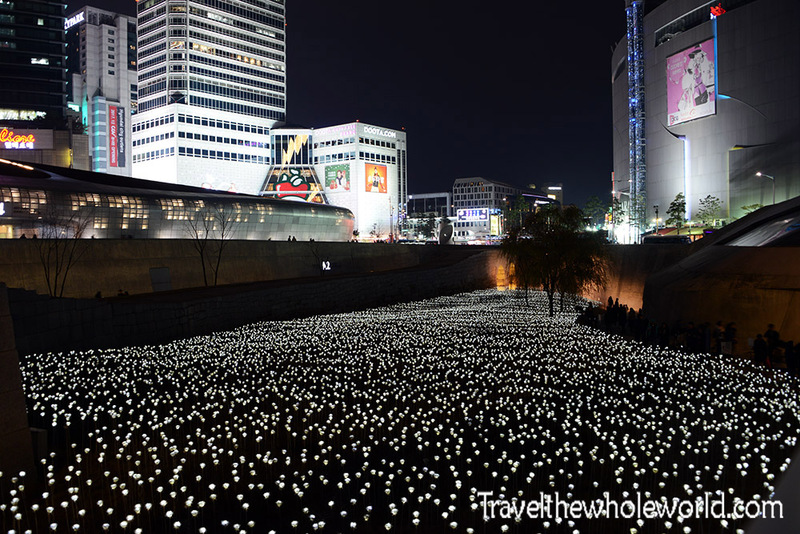 The giant tear drop was created by some 1,300 dog tags of those who lost their lives.